Our three young athletes gave a terrific account of themselves at the Munster Juvenile championships in Ennis at the weekend. 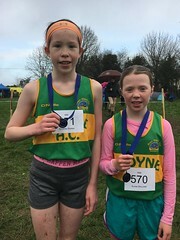 On Saturday Alana Spillane and Saoirse Doran took part in the U/10 500mts and U/11 600mts respectively and produced two excellent performances against tough and competitive opposition. Up first was Alana, making her first ever foray at this level of competition. Timed heats were the order of the day with Alana in Heat 2 and what a run she produced to finish third in a time of 1.47.02. The waiting game ensued and when all heats were run and times organised she was credited with 13th place overall from a field of 36 athletes. It was then Saoirse’s turn to take on her competition and again heats ensued as 28 athletes had entered. Saoirse also produced a terrific performance – lying in 4th place close to the finish but overtaken on the line to finish 7th in a time of 2.04.09 which put her 12th overall on the list. What great achievements by these two athletes and congratulations to each of them on their outstanding performances. Sunday came and it was the turn of Sean Boland to keep the flag flying high for the club which he duly did with an impressive performance in the Boys U/10 Long Jump to finish in 22nd place overall with a leap of 3.18mts from a field of 42 competitors. This was also Sean’s debut at this level of competition and he handled it expertly – well done Sean on a terrific performance. All three can now look forward to the Munster B championships in July.